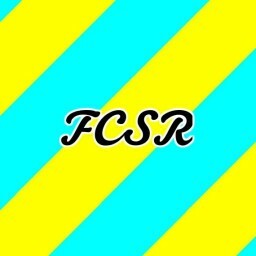 Back in August, the boys at FCSR did their annual NFL predictions. Who would win the divisions? Wild Cards? Championship games? Super Bowl!!? So yeah ok, Everyone and their twisted monkey can make predictions. We like to think of ourselves as somewhat of a rebel group, on the fringe of sports media, plunging our fists elbow deep into the abyss that is knowledge based on a predication of past events…..
Yeah, just stick with the fringe part and you’ll be fine. In all, the five players here that made these choices did fairly well. Shockingly well? No. I picked the Falcons, Giants, Ravens and Texans as you can see in the photo from our radio studio with the greaseboard (that would be my doodle). My good friend David Kososki picked the Browns. We can’t be perfect or we wouldn’t have anything to discuss let alone razz each other for. 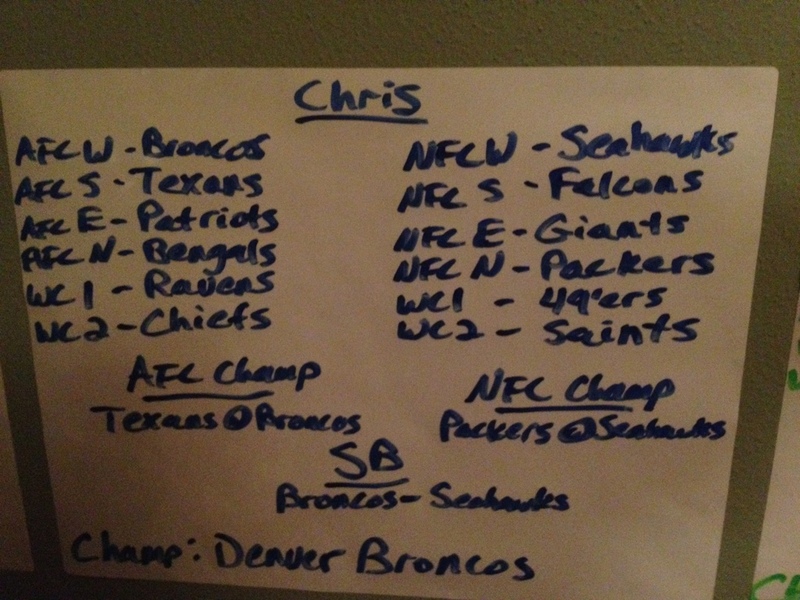 Let’s look past that and realize that my big game pick is still intact — Seattle vs. Denver. I really went out on a limb on that one, right? All week the foot-stompers have been talking up Brady v. Manning. I’m not going to do that. I will tell you however that if you dare to seek out coverage on the Broncos and Patriots matchup, simply turn on any number of the ESPN outlets and wait less than 180 seconds. You’ll be pleased. Tom Brady and Payton Manning are like show dogs and the only way this would be better for the four-letter network would be to insert a fantastical Schwarzenegger rule by which the horses and minute-men are actually playing in the Bigger Than Life Bowl instead of a measly AFC crowning game (that’s where the poodle comes in). We, like the monolith of sports media, can’t be that lucky. Would I mind seeing Brady v. Manning in New York in February? Sure, as long as it’s a game that they’re playing in at a neutral site as opposed to Tom walking Payton around the Manhattan fashion district to parade him out in new, trendy threads and explaining why neutral colors are a good fit for the Big Apple, but he needs something more rustic for the Rocky Mountain region. We (hopefully) won’t get either. On the same thought, I don’t need to see Colin Kapernick give Russell Wilson style advice, either. 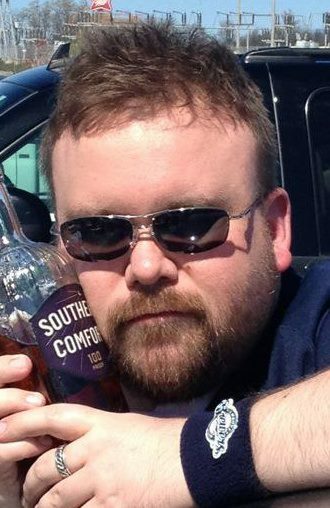 If that were to happen, Wilson would show up to Qwest Field with a Jets hat turned left sporting a mean-mugged duck face. Sorry, now you have that image stuck in your head for the rest of the winter. As for the games, I believe they’ll be close. I believe we won’t be disappointed. Great analysis. Ok ok… These games are won in the trenches, with running games, with solid defense. Forget the fact that Manning’s arm slung out record-setting numbers this year. Forget that the New England defense has been torn up by injuries. Forget that Russell Wilson has looked nearly forgettable in his last few games. Forget that the 49’ers are annoying everyone outside of the Bay area with their on-field antics and coach that dresses like a two-bit hobo. Denver’s defense is suspect. New England’s defense is peaking and making big plays and their running game can’t be stopped. Seattle will make earth rumble when the Skittle chomper gets in the end zone and their D is and has been lights out. San Fran (and I know their fans hate that term for their city) has swag and speed on both sides of the ball, and the best offensive line in the league. Looking at this double rainbow, WHAT DOES IT MEAN??!! It means that I’m anxious. I’m worried. I’m Gary Busey in a heroin factory with a strip tease going on with piss and vinegar running through my veins at the thought of what might happen today. I’ll be either a pure goat, or a complete genius. I’d like to say that I’ll be the only one of the radio boys who picked the Super Bowl correctly. I’d like to be the one who picked the Giants and Texans for the playoffs, but was still able to find a cloudy crystal ball to be right when it really mattered. I’m still scared though as I see the Patriots and 49’ers pulling through today. How do I go about managing this? I guess I just need to stick with my guns and pick who I picked in August, and even if I have a hunch both road teams will prevail, I am generally terrible at picking games. Win-Win, no? Maybe not, but it is the best I can do (thinking with my brain and not my heart – the noodle). 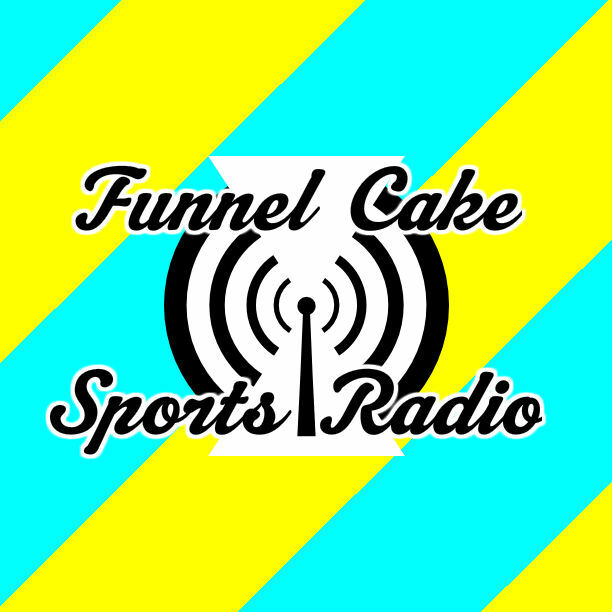 Click here to listen to Funnel Cake Sports Radio via the Tune In app on desktop, tablet, or mobile. How many times have you heard the phrase “this is a great time of year”? Winter thaw, summer holidays, Christmas time, all great times of year. Even as you sit in front of your TV’s on a Monday night in May, you can still say to yourself this is a great time of year. If you don’t know why it’s a great time of year you can pretty much guess that you shouldn’t be reading this right now. If you have to guess, it’s not just because of the weather, it’s not just because your favorite niece graduated from high school. It’s because of sports. Of course sports, what else could it be especially in my world, and hopefully yours since you’re engaged here right now. Not like the Phaneuf Cuthbert engagement, but you know what I mean. If you’re a concrete sports fan like myself then you’ll know this is a great time of year because of all of the action that’s on TV and radio. No not “Wipeout” or “Howard Stern” action…ahem, anyway. We have a great time now not just because the weather is getting nicer and baseball is out of the doldrums of early spring, but because we have NBA playoffs, the Stanley Cup playoffs, auto racing, the triple crown of horse racing, the FA cup, NFL rookie camp (ok that’s a reach) everything that you could ever think of. And what’s even better is that we can sit on the couch with our hand down her pants, the remote in other one, sipping on a drink that we have leveled off on her stomach and watch every minute of all of these sports. I’m not saying I do that, but if I where to do that, that’s exactly how it would be done. Get your favorite sports channels on lock, have enough battery juice for your remote, and make sure your bottle of soco hundy is handy… it’s time to watch some sports. Oh and just so I can throw a public service announcement in here, get outside and get some sun. you need the vitamin D.
While I’ve never experienced Patriot Day in Boston, I’ve always wanted to be a part of it. There is morning baseball, the most famous marathon on the planet, and maybe even a Bruins or Celtics game that same night. That is what I call a sports spectator’s dream. You don’t really have to like the teams playing, or enjoy the competition involved with the Boston marathon, you like the day for the event. You like it for social aspect and what the day actually represents in New England – our liberty. That all changed on April 15th. I had never been to New York to see the twin towers. I had never been to New York to see anything. My New York experience is a post 9/11 one. That experience is no less amazing in the fantastic city of New York then I’m sure it would have been pre-9/11. Now, when I do make it to Boston for Patriot Day, I will have visited post marathon bombing. Should I really be complaining about that you might ask? I wouldn’t say that I’m complaining. I would say that I am more disappointed than anything. I know that incidents like the one in Boston will most likely happen again. I don’t want anyone to think that I have conceit in my own brain about being able to attend the events in Boston and have them not be the same for me. People lost their lives and other were very badly injured, all focus is on finding who is responsible, and the pain that the victims, families, and a great American city will have to endure on their way toward healing. What does raise an eyebrow or two with me, beyond trying to understand why such things happen in our world, is when will this happen again? I’d like to believe that nothing like this will ever happen to me, my friends, or my family at a sporting even, or any event for that matter. The hard fact is that with every day that passes it becomes more and more likely that terrorism will affect us in some way. I don’t have cold statistics to back up that claim, but our society and the cultures that reside in it are forever changing. Not even the bomb sniffing dogs can ensure that we or someone close to us won’t get our legs blown off while watching a race. That may sound harsh, but it is the truth. It’s the truth because the tragedy is Boston taught us that. Boston also reminded us of that old saying “if we stop going about our lives, the terrorist’s win”. I hate that term. That term doesn’t hold a lot of weight to me. That term is soft in every sense of the definition of the word. Unfortunately, there isn’t a better phrase to describe what I’m getting at. I don’t want them to win. I want to beat them senseless to within an inch of their lives, let them recover, beat them again, and then slowly bleed them from their toes. See, nothing soft about that statement. My heart goes out to everyone directly involved. I wish I had more words of wisdom to impart on the masses. If nothing else, this attack makes me want to go to Boston next year and make sure I’m involved in every last little detail of Patriot Day. Terrorists should know by now – We American’s won’t stay down long. When you proverbially tell us that we can’t do something, we try to do it one hundred and forty-seven thousand times more and then some. See you next year Boston!